Christie revealed that it will be part of the American Red Cross' "Prepare SoCal" campaign, which aims to prepare Southern California businesses and households for natural disasters such as earthquakes, floods and other emergencies. 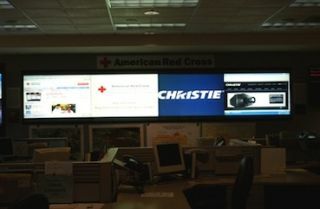 Through its contribution of four Christie LWU420 3LCD digital projectors for the American Red Cross' Orange County Region Emergency Operations Center (EOC), Christie will be powering real-time emergency information during disasters. The American Red Cross Orange County EOC serves three counties (Orange, Riverside and San Bernardino); an area that would affect 453,000 businesses and 4.5 million workers if there was a large disaster. Known as a first responder in many natural disasters around the world, the American Red Cross is launching the renovated center as part of its "Prepare SoCal" initiative, which involves improving its local disaster response capacity, training more volunteers, and strengthening links with neighborhood and other community organizations. The EOC, situated at 600 Parkcenter Drive in Santa Ana, CA, will be the hub of activity in any emergency and linked with public health, emergency service and other government agencies to provide vital information. Its grand re-opening is July 28. The EOC suite, including the EOC and Room #213, is a 2170 square foot facility, not including technical support space. In addition, there are also two classrooms that have additional voice and data capability and can be quickly converted as a call center or support space, and another 120 square foot communications room with telephone, radio and satellite capabilities to provide emergency communications support for the EOC. "We're very proud to be part of this important community initiative," said Jack Kline, president and COO, Christie Digital Systems USA, Inc. "We helped the Japan Disaster Relief Fund last year, through staff volunteerism and the donation of equipment, so it was natural for us to look closer to home to assist the American Red Cross, as our projection systems can make a life-saving difference in communicating information during natural emergencies." Ty Woolworth, corporate relations and development at the Orange County American Red Cross chapter, learned of Christie's technology and altruism during the Japan crisis, and decided the company would be a good choice for meeting the Red Cross needs for reliable digital projection that can adapt to the challenges of a rapidly changing situation. "We knew Christie could do an amazing job at updating our EOC, and helping to sponsor Prepare SoCal, so that we in turn could provide the best possible information and service during any emergency," said Woolworth. After the installation, support for the projectors will be delivered by Spinitar - a full-service AV company headquartered in Orange County that is a Christie-certified audio/visual supplier and one of the industry's top fifty integrators in the United States. The compact and portable Christie LWU420 digital projector is designed for educational facilities, corporations, government agency and house of worship applications that require high brightness and cost-effective widescreen 3LCD projection at 4200 ANSI lumens. The line features 3D Keystone technology, a four-corner geometry connection tool for image alignment on flat or simple curved screens.